How about a travel with self-growth and little self realization? Even as the reel life ‘Wonder Woman’ vibe strikes us, here’s a story of a real life ‘wander’ woman. The Koreans probably call her ‘One-Shoe’, but to her friends, family and fellow travellers, she is Ansoo Gupta; in short, a person who has wheels attached to her feet. 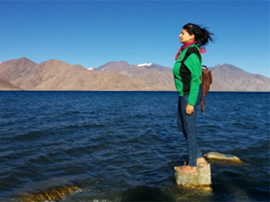 An avid traveller and an adventurer herself, Gupta wants to instill an indomitable spirit within one and all. Her ‘One Shoe Trust’ intends to create a passion for travelling among the people. To begin with, could you tell us how unique is your business model? How would you differentiate yourself from so many other players in the market? One Shoe Trust for Responsible and Mindful Travels is a social enterprise. The main motto of setting up this venture was to create awareness among the travellers, so that they could explore the world and fulfil their travel dreams. We are here in the market to educate the world in the field of travelling, inspiring people to travel more and most importantly how to travel right. Travelling is not just going somewhere and seeing the sights. We inculcate the sensitivity to local cultures and to the environment as well. We conducted a session about Japan, as number of tourists to Japan from India was increasing. Here, the participants got to know about the hidden gems in Japan that they shouldn’t miss, they got an insight to the finer points of Japanese culture, story of Sadako (Hiroshima) and even their cuisine. Our other workshops also give a lot of practical information about how to travel better. Coming to the second part of your question, we are not a travel agency like other players in the market, we are a social enterprise that aims at creating travel consciousness among people. We want to use people’s love for travelling to help them understand our world better. How did you go about choosing such a name? Frankly speaking, there are two reasons to it. In the first place, my idea was to try and help travellers reduce their carbon foot print as travelling could be very polluting, I wanted to simplify the jargon, make it easy for everyone to be environment friendly, think about reducing consumption, hence ‘one shoe’ . Could you tell us about some new things in the pipeline? Is your organisation a profitable one? We undertake various events and awareness activities – both online and on-ground. We do road shows in colleges and corporate where we arrange for events, provide for destination-based workshops. Our signature workshop is the one where we give practical tips and tricks of how to travel more. Then we also do specific destination-based talks like the one for Peru – what to see there, their amazing food experience etc. We have also been conducting special sessions for women travellers, solo travelling, how to make travel enriching for kids, cruises around the world, and even special sessions to understand flora and fauna of specific places. These are fun sessions and far more interesting than reading all this in guide books! We are of course a profit making organisation, but our larger aim is to spread the word of consciousness among the burgeoning mass of Indian travellers, that would be a larger profit. Is your company bootstrapped? Did you have to find an investor? Yes, my firm is bootstrapped by me. We are quite enthusiastic about the growth as we help people travel more and the impact that we create on them is purely on non-monetary terms. In last four years, our workshops have become very well-known and people write in to ask when the next workshop is being planned. We have covered eight cities in India and want to expand even more with events at a very large scale. Your passion for travelling explains that you have to travel frequently. How often do you travel, and what excuse do you give to your family and office each time you take an off? Well, I have a huge list of dream destinations and I don’t have a set calendar for that matter. However, I always have an eye at the flight fares, if they are manageable and if I have the opportunity, I don’t think twice. You will be surprised how many leaves we actually do have in the whole year. If you plan your long weekends etc properly, everyone can build in a lot of travel along with their regular job and these days with all work being done electronically, you could be anywhere in the world and still be in touch with your office and home and also do the required work. I work very hard to balance everything. When you are clear about your goals, and know that there would be two extra days in a month that would be solely yours, I am sure you could figure it out . How do you balance yourself between family, work and passion? Striking a balance is important, and especially when you know how all of them are important to you. Problem arises when you don’t know what do you want from life. Then everything becomes overwhelming. With focus, it is all easy to manage. Any suggestions that would like to give to fellow startups in the travel sector? Yes, the travel landscape today is totally different from what it was till about five – ten years ago. These days, everyone has an easy access to information and the ability to book everything themselves. So the margins available due to information gap or lack of technology have disappeared. The urban Indian traveller also has more evolved tastes now and doesn’t want cookie-cutter travel packages and does not want to travel in large groups. So understanding the customer’s personality, likes and dislikes and customising the travel plan for them is key. Lastly, everyone involved in travel sector must pay attention to environment, climate change and the impact on local economy. We are travellers, we love this planet and we must fulfil our responsibility. At an age where people are more stressed than ever about their daily survival, travelling surely brings back the zing back into their lives. Why not travel that extra mile before we sleep? How has travelling influenced your life so far? Do share your views.